A Mexican-inspired bar and taqueria in Clapton. Please note, Del 74 has now closed. Time Out Editors, November 2018. Apart from a small, brightly-coloured sign, Del 74 – a pop-up bar and taqueria that’s gone permanent – is pretty inconspicuous from the outside. But once you step inside, it’s a different story. A green gnome and inflatable cactus sit on the bar, which is lit up with pink and purple lights, while the walls are adorned with even more inflatable things (a banana, naturally), a bike and prints with a Californian vibe. And while it’s not often that a bar’s toilet is worth mentioning, with bright, flashing fairy lights, an inflatable parrot and a radio pumping out the tunes, the loo is like a mini disco. The booze menu is short and sweet, making things easy for indecisive orderers. The michelada (that’s a beer-y bloody mary, fyi) came in a huge glass tankard with a chilli rim, offering a fiery twist on the bar’s Mexican beer selection. 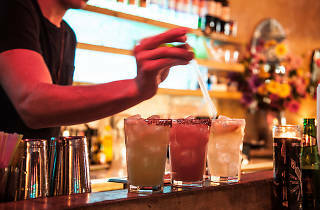 But you can’t miss the margaritas: choose your booze – tequila or mezcal – and then pimp it with lime, watermelon or cucumber. Even if you’re the type of person who ducks out when someone suggests a round of shots, these bad boys will go down swimmingly. They keep things simple on the food front, too, with a few well-crafted bar snacks. The fish taco came with a zingy slaw, while the pork pibil taco was stuffed with slow-cooked meat and topped with pickled onions – both were excellent. If you want something simple, opt for a quesadilla – oozing with melted cheese, it’s exactly the kind of food you want when you’ve been knocking back margaritas. The bar itself is fairly small, so get there early if you want to nab a table. But with banging beats, good vibes and margaritas which slip down a little too easily – you might find it hard to stay in your seat. We went for brunch yesterday and were a bit confused to end up on Kingsland High St after heading for Clapton, to discover that one closed. Anyway, we tucked in to Chilaquiles and Enfrijoladas with Margaritas after a cold Pacifico - so good to find my fave Mexican beer! The food was as authentic as anything we have found in London, though we didn't have the entire menu! My partner agreed; she's Mexican and always says she can't find a real Mexican breakfast in London. Apparently the new chefs are from Jalisco or somewhere west of Mexico City, rather than somewhere here, which has to help. Beans and Queso Fresco accompanied and were perfect. Fiery salsas and excellent, freshly made guacamole helped it all along. The Margaritas were a little less lethal than I expected, but had one replaced for free when I said it was a little sweet. Friendly service and good music. Quite low key but we enjoyed it. The food isn't 'fancy', but real and will deffo go back. I popped into here today for the veggie tinga taco (jackfruit and sweet potato). At 2.5 a pop it's a steal. Delicious smokiness that left a wonderful lingering taste in your mouth. Small menu, keeps it simple. My one big negative though is when I walked in, no one greeted me hello, there was no indication where do I order. I asked a bartender/waiter and he was so grumpy in his response I almost walked out. Why do staff in London insist on treating their CUSTOMERS like rubbish?! Anyway once I ordered from him and got my food he became a bit cheerier. Just not sure I would return here. 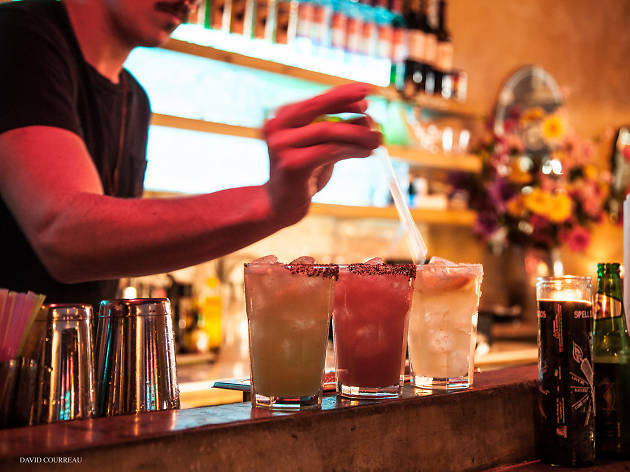 Right now, there are more taco joints in London than well-dressed socialites at Pippa Middleton’s wedding and Del74 in Clapton is one of the newest spots at which to get your fill of mezcal, margaritas, Modelos and oh yeah, some pretty great tacos. Originally a pop up and now a bricks-and-mortar dive in the heart of Hackney, this place is loud, friendly, fast paced, low key and comes from Enrique Vivas (Boho Mexica) and Jorge Felizardo (co-launched Taberna Mercado). The menu is small – bonus points as always for anywhere that doesn’t make me spend longer reading the menu than eating the food – and, in a nice quirk that pays homage to high street stalwart Argos, comes as a piece of paper for you tick what you want. FYI, in case you’re wondering, that will be pretty much everything. Six tacos and 3 quesadillas cover everything from barbecoa to steak to roasted vegetables and ooze off the plate and down your arms in a spectacular show of drippy, delicious flavour. Guacamole is as creamy, salty and chunky as nature - or those super clever Aztecs at least – intended it to be and washed down with frosty beers, it’s the only way to start. Make sure you order the tilapia – savoury chunks of fish and a mountain of crunchy, tangy slaw – and the cochinita pibil – absurdly juicy pork topped with avocado and pickled pink onions; there were no napkins left on our table by the time we were done which, let’s face it, is absolutely as it should be. You might not imagine you'd end up spending the whole night here and no doubt it would be an excellent place in which to kick off your evening, however, 2 rounds of drinks and 3 rounds of tacos down, I’d go so far as to say you could comfortably & with the minimum of effort end up spending several happy hours here – just make sure to ask for extra napkins.